Whether you’re looking to impress someone special or just need a break to recharge Dubai doesn’t disappoint. From island resorts shaped like palm trees on picturesque beaches to the largest structure in the world, it’s clear that everything about Dubai is built with excess and luxury in mind. The price tags may be as steep as the skyscrapers, but the experiences are certain to be well worth the cost. The Burj Khalifa is the tallest man-made building on the planet and home of the Armani Hotel. Out front is the largest artificial lake in the world with a synchronized fountain show that cannot be missed. The Atmosphere Restaurant is the highest restaurant in the world with a view that looks out over the magical city of Dubai and has some of the most exquisite cuisine that money can buy. Just above Atmosphere is the observation deck where you can stand 124 stories tall over one of the most indulgent cities in existence while plotting your next move. Although Dubai is known for its extravagant shopping malls and resorts, perhaps you’re looking for something off the beaten path. There are countless ways to entertain yourself in and around the city. Crystalline beaches and kite surfing are a great way to cool off in the desert heat and there’s also camel rides and dune buggy rentals if you want to explore inland. If that’s not enough to get your heart racing, how about an indoor ski resort? Ski Dubai, inside the Mall of the Emirates, is a testament to human ingenuity and the power of wealth to maintain a freezing climate in the middle of a desert. Before packing up those bags and heading home, we’ve got one more place to stop by and you know we saved the best for last. 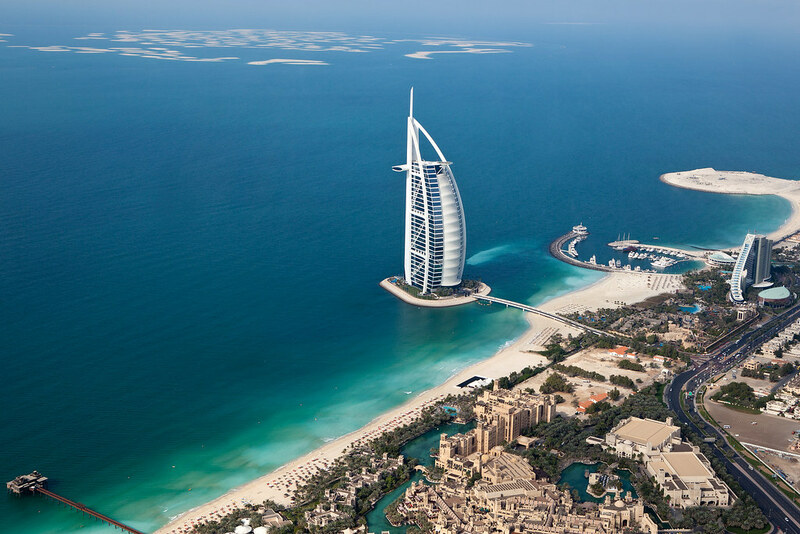 Burj Al Arab is often described as the worlds only 7 star hotel. The dining and accommodations are extraordinary even by Dubai’s standards. The complex occupies it’s own artificial island and has helicopter access near the roof. Aesthetically the design resembles a giant sail out in the gulf. There’s a couple of different options for world class dining available. Al Muntaha or “The Ultimate” looks out over the Gulf from on high, but if you want to try something different and even more unique, Al Mahara or “The Oyster” is accessible via a simulated submarine ride and will allow you to dine inside of one of a kind seawater aquarium. It’s clear that Dubai is all about luxury and offering one of a kind experiences that you can’t find anywhere else in the world. Don’t you deserve to get away to Dubai?